Rodama: a blog of 18th century & Revolutionary French trivia: The blood of Louis XVI: Found....and lost? The Blood of Louis XVI? 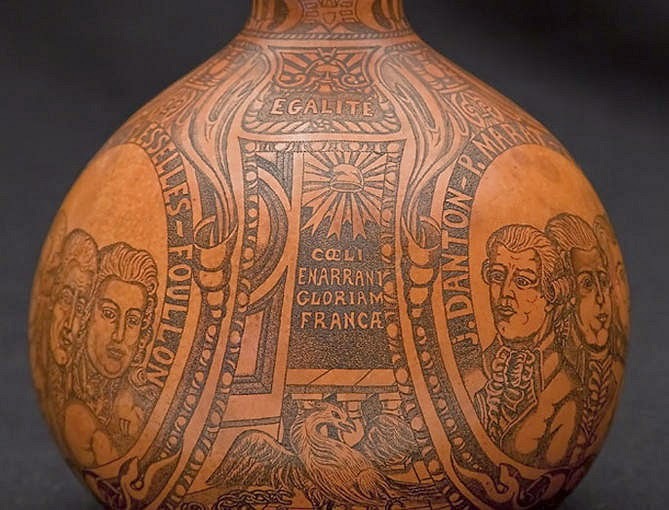 a decorative gourd said to contain the blood of Louis XVI was submitted for analysis to a Spanish team of forensic biologists team under Carles Lalueza-Fox of the Barcelona Institut de biologia Evolutiv. 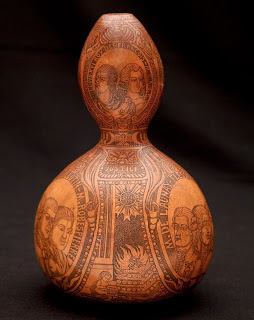 The gourd, of a sort typically hulked out as a vessel contain gunpowder, bore the inscription, "Maximilien Bourdaloue on January 21st dipped his handkerchief in the blood of the king after his beheading".There was no cloth inside, but researchers were able to scrape dried blood from the interior. Early results of DNA testing were promising. The sample was from a male and there were strong genetic indications of an individual with blue eyes. The Y-chromosome was identified as being from a haplogroup - a set of inherited genetic variations - so rare among modern Eurasians that it was concluded that the sample must indeed belong to a royal line. The team now needed comparative data. One possibility was the heart of Louis XVII in St.Denis which had been authenticated by DNA analysis as long ago as 1999. Unfortunately this research had relied on mitochondrial DNA, which is inherited from the female parent (the heart had been matched with genetic material from Marie-Antoinette's hair); there was no data on the nuclear DNA needed to verify the paternal line. Happily, there remained another possibility - the mummified head of Henri IV, which had been opportunely rediscovered amid much publicity just two years earlier in 2008. Philippe Charlier, the charismatic TV forensic archaeologist, who had led the work on Henri IV, promised his collaboration. Up until then, identification of the head had rested mostly on carbon dating and x-ray comparison to portraits. Only a tiny amount of genetic material could be isolated. Nonetheless, despite the scarcity of markers, five out of six DNA sequences (alleles) matched those identified in the blood from the gourd. These were all rare. Professor Lalueza-Fox felt able to conclude confidently that it was "250 times more probable" that the two samples were paternally related than not. So far, so good. Dr Charlier - who has access to many illustrious body parts - even promised further corroboration in the form of genetic material from the leg of Louis's mother (or at least a close female relative) which might prove a match for any mitochondrial DNA which was isolated. 1. Lalueza-Fox, Carles et al. "Genetic analysis of the presumptive blood from Louis XVI, king of France" Forensic Science International. Published online 12 October 2010. "Mummified head and bloody old gourd used to identify Louis XVI DNA" Wired, post of 3rd January 2013. Not the blood of Louis XVI? The first dissenting voice was Professor Jean-Jacques Cassiman from Louvain University, who in October 2013 published a new study of the head. Professor Cassiman, took a new approach by examining DNA of from three living Bourbons - prince Axel of Bourbon-Parma, prince Sixtus of Bourbon-Parma and prince João Henrique of Orleans-Braganza - all of whom have Louis XIII as a common ancestor. They checked out - all shared a rare haplogroup indicating their illustrious descent from the Capetian kings of France. However, the DNA from the head, and from the blood in the gourd, matched not at all. It was simply impossible, declared Professor Cassiman, that these could represent the remains of Henri IV or Louis XVI. In April 2014 the final blow was struck when the original Barcelona team under Carles Lalueza-Fox, which included Philippe Charlier himself, published a complete genetic profile of the blood from the gourd. Professor Lalueza-Fox was honest enough to retract his earlier findings; he did not have the tall Louis, with bulging blue eyes and Saxon mother at all: this was in all probability a short, brown-eyed individual of Italian descent. According to an AFP bulletin, Charlier now admits that the link previously found between the individuals represented by the head and the blood in the gourd "may have been coincidental". But he still insists that the new report "does not place into doubt the authenticity of the head of Henri IV,". As to Louis XVI, the study concludes, "It could still be possible, although implausible, that the gourd's blood could be that of the French king," Ouch! 1. Cassiman, Jean-Jacques et al. "Genetic genealogy reveals true Y haplogroup of House of Bourbon contradicting recent identification of the presumed remains of two French Kings" European Journal of Human Genetics (2014) 22, 681–687. Published online 9 October 2013. It is all very disappointing. But there are still some interesting questions raised. Would it actually have been possible to collect the blood of Louis XVI? Surprisingly enough, the answer to this one is "yes". Blood ran into a trough under the guillotine and at Louis's execution guards, and even members of the crowd, were allowed access. The blood did indeed become a sort of Revolutionary talisman. "The theme of blood as a good-luck charm ... is distinctly present in narratives of the execution. "Louis's head has fallen; it has been shown to the people," comments La Révolution de 92 in its January 22 edition. "Right away volunteers stained their lances, others their handkerchiefs, and then their hands, in the blood of Louis XVI." The Annales de la République française returns three times to this flowing blood and its supposed power, each time giving new details, more and more precise and explicit. First on January 22: "The execution over, the executioner presented the head to the people. A number of people hurried to get hold of his hair, others drenched paper and even their handkerchiefs in his blood". Then, on January 25: "It is not only his hair that people have gotten hold of and sold, for they had the same eagerness to get pieces of his clothing. We noticed a young foreigner, well-dressed, who gave fifteen pounds to soak a white handkerchief in the traces of blood. Another seemed to attach a great importance to obtaining some hair, for which he paid a louis. Many drenched their swords or their lances in the blood". Finally, on January 28: "The executioner, surprised at the eagerness of so many to drench their sword or their lance in Louis's blood, cried out:"Wait a minute, I'll give you a tub in which you can soak them more easily" . "They say that the citizens drenched their handkerchiefs in the blood. That is true. And many volunteers hurried to drench the iron of their lances, the bayonet of their rifles or the blade of their swords in the despot's blood. The police were not the last. Many officers of the battalion from Marseille and others saturated the envelopes of letters they carried on the top of their swords with this impure blood, saying: "Here is the blood of a tyrant". 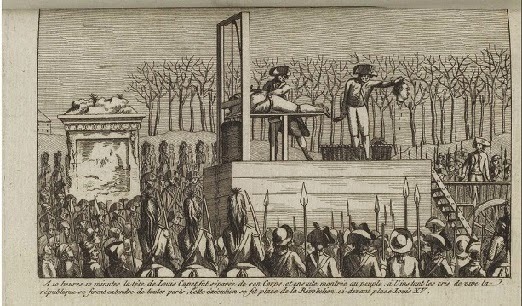 One citizen climbed up to the guillotine itself, and plunged his whole bare arm into Capet's blood, which had collected there in abundance; he filled his hand with clots of its, and three times showered the crowd of attendants who pressed up to the foot of the scaffold to receive, each one, a drop on their forehead...."
There are dozens of websites reporting the scientific findings, but hardly anything sensible has been written about the gourd, which is, to say the least, a curious relic. It has been owned by the same family from Bologna for more than a hundred years, and is described in a letter addressed to the director of the Musée Carnavalet, dated January 31st, 1900. Otherwise there is no provenance, except for the inscriptions on the object itself. The crucial one reads "Finished today, 18th of September 1793, Jean Roux, Parisian citizen, author." The phraseology seems a bit awkward, but presumably "Jean Roux" was the artist who did the decoration. Without this information, no-one would suppose that the gourd originated in Paris. 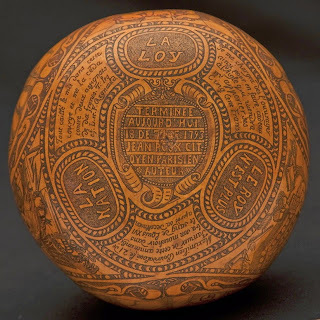 It is true that "calabash" or "bottle gourds" - this one belongs to the species Cucurbita moschata - were frequently used for storage, particularly of gunpowder. But they are tropical or semi-tropical plants, not products of the market gardens of Paris. Examples of highly decorated ones tend to come from places like North Africa or Cyprus; there are no Parisian examples that I can find on auction sites, and certainly no trace of a "Jean Roux". Admittedly Roux was a common name - and perhaps he was only an amateur. On the other hand, pyrography was a specialised technique and the decoration is very accomplished. The iconography is muddled and does not really suggest the work of a denizen of Paris in the Year II. There are groups of portraits of "prominent lead actors during the French Revolution", which include not only Robespierre, Danton and Marat but also Dr.Guillotin and Louis-Sébastien Mercier. Also featured are Bernard-René de Launay, the governor of the Bastille, Jacques de Flesselles and Joseph Foullon, all of whom were royalists lynched on the 14th July. Louis XVI himself appears as "King of the French", and there are depictions of Marie-Antoinette and Jacques Necker! All the busts feature generic bewigged eighteenth-century gentlemen rather than ardent revolutionaries. "Maximilien Bourdaloue on January 21st dipped his handkerchief in the blood of the king after his beheading"
2.Tout caillé le mis dans cette courge et me la ceda contre deux assignats de dix Francs. T. Pes c.f. L.er. F. Aegnauld. "Once congealed, he put it in this gourd and gave it to me for two banknotes of ten francs. T. Pes c.f. L. er F. Aegnauld"
3.Je me chargea des l’ouvrager ainsi pour en faire cadeau a’ l’Aigle qui viendra m’apporter ses Cinq Cent Francs "I took it upon myself to have it decorated so I could make a present of it to the Eagle ("l'Aigle") who will bring me his Five Hundred Francs"
This reads much more like some sort of accompanying note than an inscription, yet from the photos the text seems of a piece with the surrounding decoration. If someone was hoping to sell the piece for a profit, why mention the money on the object itself? And who is the "Eagle"? If it is Napoleon, as has been suggested, the dates are wrong; in September 1793 Napoleon was still an obscure artillery captain. None of the names check out, at least not on the internet. "Aegnault" (as opposed to "Regnault") doesn't seem a real French name at all, and what do the abbreviations T. Pes c. f. L er (?et) F. mean? Someone must have some theories! Ironically enough on 3rd April 2013 Drouot auctioned a piece of cloth stained with the blood of Louis, without any DNA authentication (though admitted with a note from a real person, Colonel (Joseph Antoine René ) Joubert. It fetched nearly 19,000€ - relatively modest but still worth having.